The thing with joining a group tour planned by the agency is that I wouldn't know how to get to the places we go (since we were driven there and I'll be asleep most of the time. LOL) and also won't be able to know the place's name. What if I wanted to go there again, right? Especially places that aren't listed in the Travel Adviser website. Oh well, let the picture below become a reference in the future lest I come visit again. Hehe. The Silk Factory in Beijing! It looked like an igloo to me. Hehe. Once inside, we were given explanation by a guide there. Didn't take his picture though because I was preoccupied with the silk worm's life cycle on their wall. So they use silk worms to produce China Silk eh? New knowledge for me. I never knew that silk were from worms! Haha. So ignorant of me right? They kept this worm in a jar. It was sooooooo longggggggg!!! Thank god I wasn't the squeamish type. Better to gawk then squeal. Erk! More pictures below. China Silk in the making. 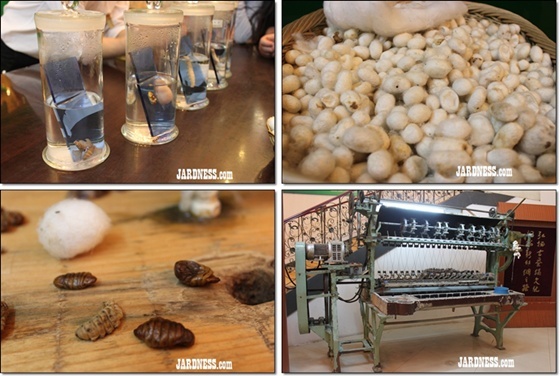 Clockwise from left : Jars of actual silkworms in every cycle of their lives, stack of cocoons, dead silkworms from inside the cocoons, and last, the big sewing machine to produce cloth. The cocoons of the silk worms are made from silk. So before they become moths, that will be the best time to get their cocoons for their silk. The silk is then used as thin threads to make any cloth possible. I noticed that China Silk is sold in abundance in Carrefour Wangsa Maju. Wonder if it's the same kind? The guide showing the latest silk products. The promoters were keen on selling their bedroom silk products after explaining the origins of silk. I didn't fancy their prices though as I was on a tight budget. Divide the prices by half and you get it in Ringgit Malaysia. 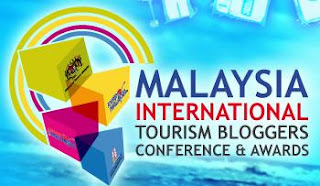 Hey guys, thank you so much for your support on voting my blog in the "Tourism Travel Blog" Category. Love you readers much! muahh! muahh! OH ya, if you haven't voted yet, hope you don't mind voting for me here.. THANKS! does that mean to get silk, the worm can't be a moth and has to die? almost like to get the pearls.. you have to get it from DEAD oysters. hehe. Hello, this is my 1st time visiting..
@thristhan... hehe. best of luck to u too beb. @hazman.. aku tahu ckp "thankyou" ja dlm chinese dgn "tak mahu"! hahaha..
@jiej.. hehe. aku mudah tertidur dalam kenderaan yg bergerak. my weakness. Saya berminat dgn kilang sutera ni. Boleh tau tak kat mana lokasi kilang ni dlm Beijing? Saya berminat dgn kilang sutera ni. Boleh tahu tak di mana lokasi kilang ni dalam Beijing? 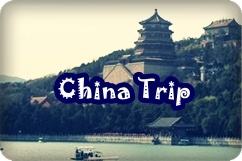 Hi... maaf.. dah lama trip ke beijing ni.. sy pun tak pasti kedudukan kilang ini sebab bergantung sepenuhnya dengan tour guide yg bawa aku ke sini. Beijing Trip day 4 - The "Boyfriend"